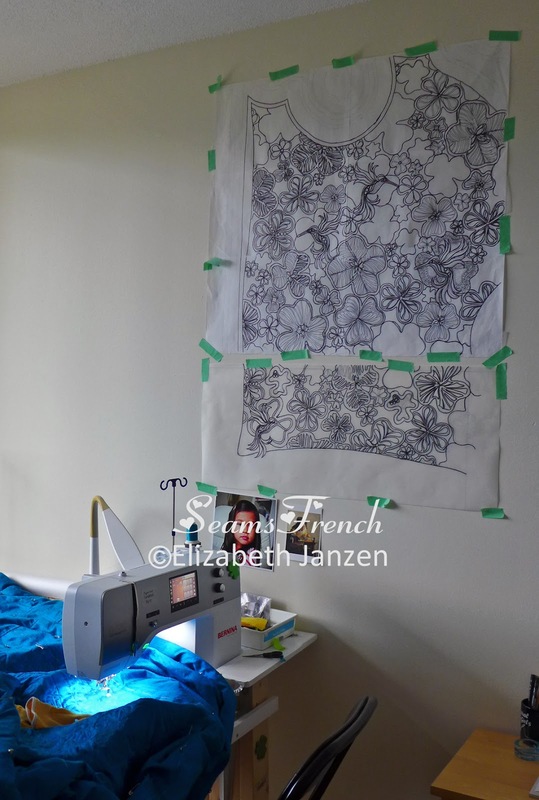 Above is the full size skeleton design of my quilt top, 60" x 80", without borders. 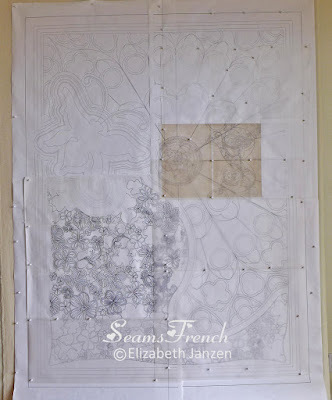 Some design details have been drawn on transparent mylar, and overlay the pattern skeleton. Taking one quadrant of the pattern, I found all of my major registration lines: centre cross hairs as well as the borders. Because the registration lines are key to keeping the design balanced and squared throughout the quilting process, I basted them. (Chalk markings would rub off long before the design has been stitched.). I had a second full size pattern printed which I cut up into the main design sections to create templates, (see below). 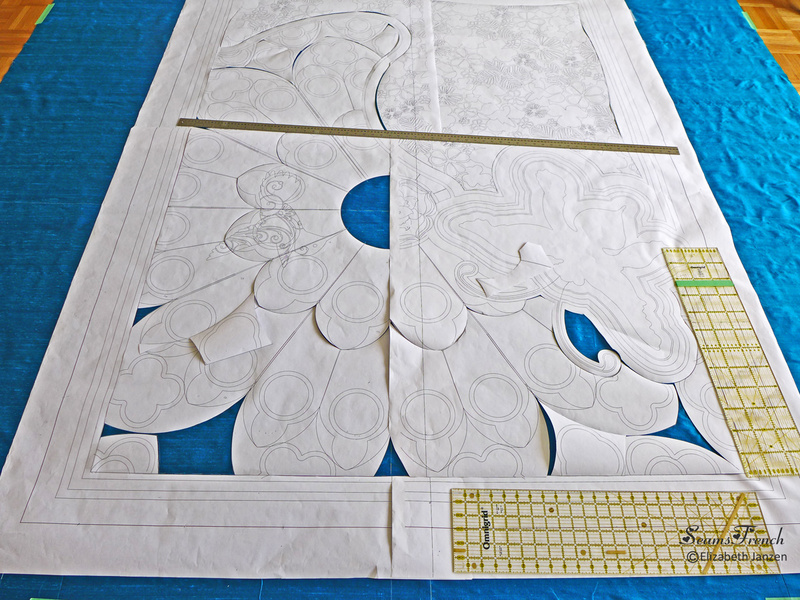 Once borders and center lines were marked, I traced all major design lines using the cut out skeleton as templates. 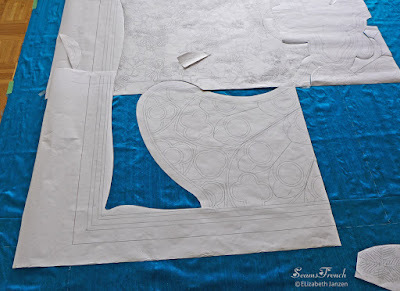 As the lines became faint during the quilting process, I could lay the templates over the top and retrace. I worked on one area at a time, removing templates as needed to complete the design. 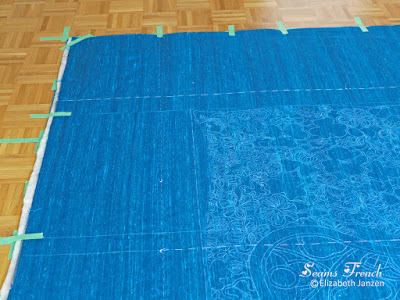 With borders and skeleton marked, I could now remove the top from the floor and move to a tracing table to add detail. My tracing table is a large sheet of acrylic that I place between 2 tables of equal height. 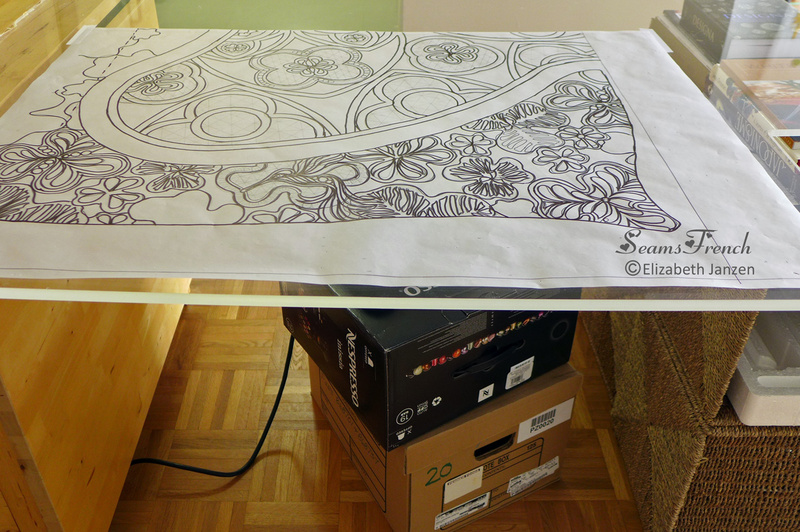 Underneath the table, I have a raised lamp that I can move around to suit. Working on one quadrant at a time, this is the stage that I add the details. 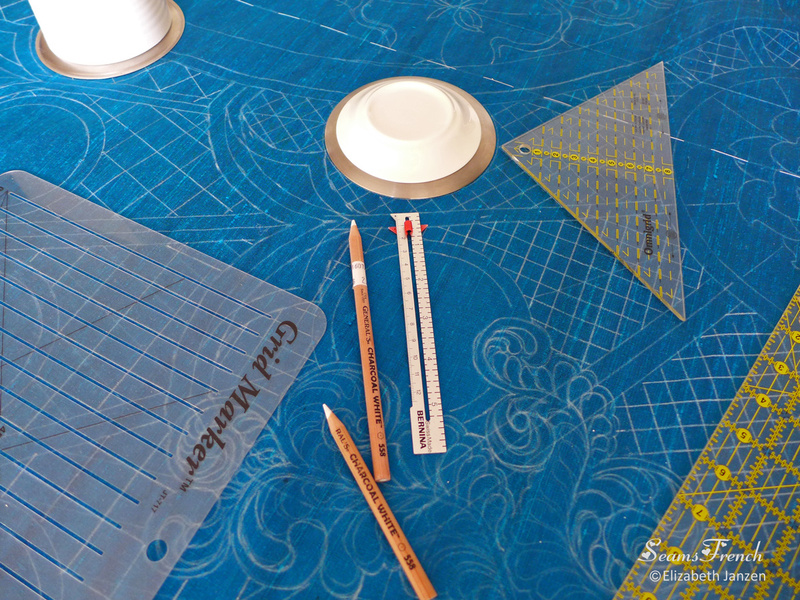 Aside from the pattern itself, rulers, a grid template, circular plates, a compass (not shown) and a white chalk marker were my tracing tools. 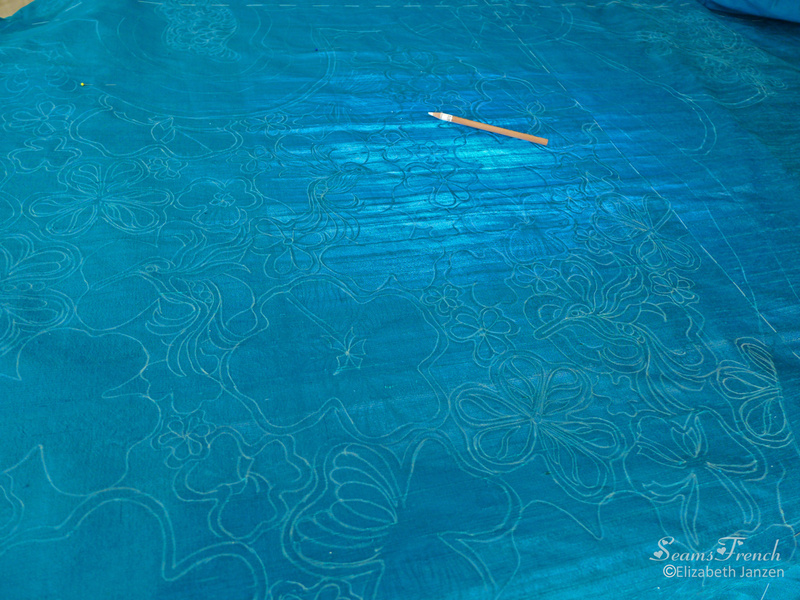 After testing many different marking options, I realized that the only thing that would show up on this dark teal silk was chalk. My favourite chalk marking pencil is "General's Charcoal White". 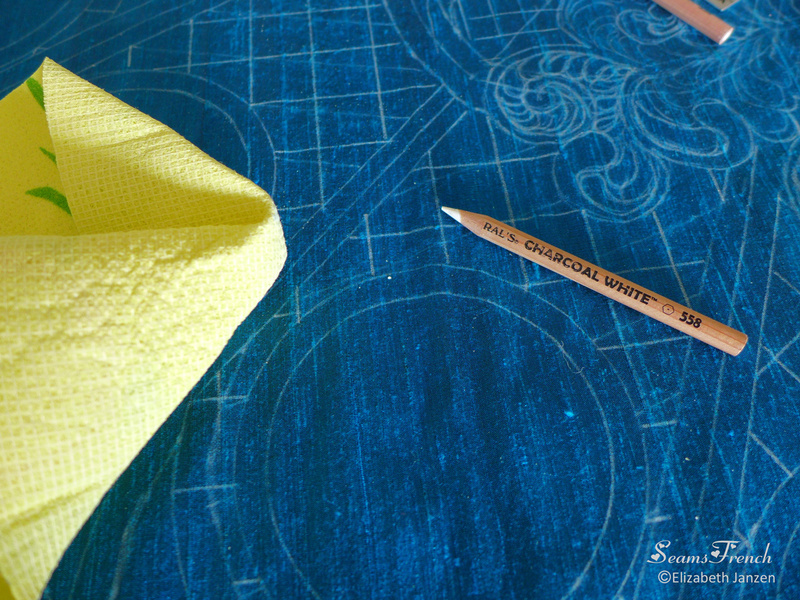 It stays on better than a lot of other chalk markers, but is also easy to get rid of. A dry sponge (left) works quite well as an eraser. 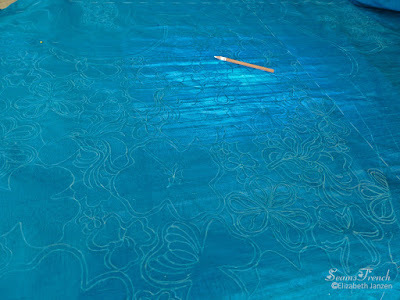 Between the pattern's heavy black lines and the light table, the design was visible enough to trace. 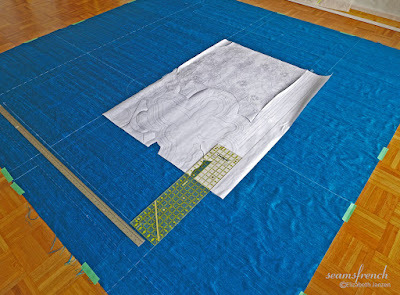 With the design transferred, the quilt went back to the floor to be sandwiched and basted. 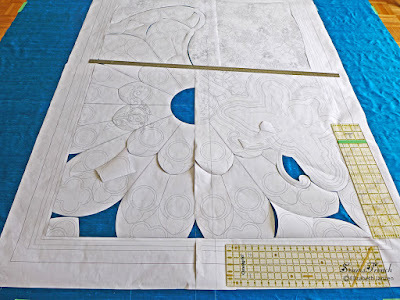 Although I had transferred a great deal of the detail (more than necessary), I knew that the chalk would rub off long before I would get to all the designs. My hope was that there would be enough of a shadow left that I could use as a guide. 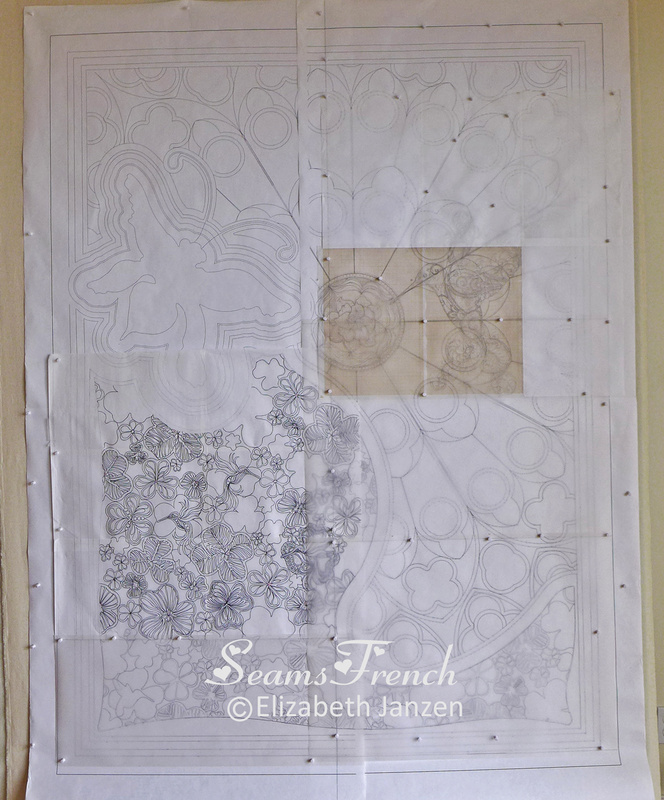 The first large motifs that I quilted (main focal points) were fine, but it doesn't take long for most of the chalk to rub off. 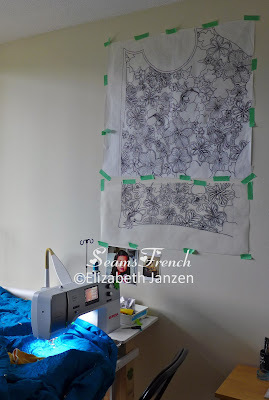 For this reason, I keep the quadrant that I'm working on near my sewing station and use it to guide me through the process, remarking the details as required. 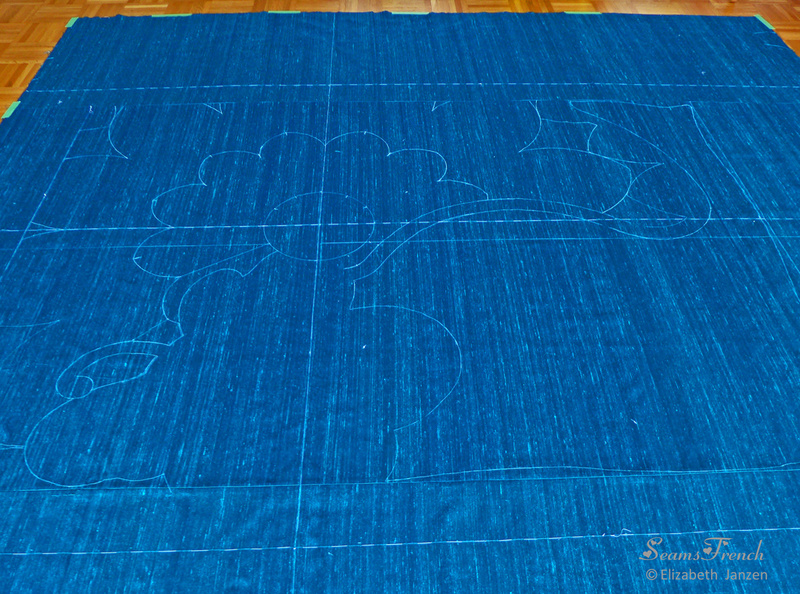 The quilt is well on it's way. Hoping for a finish before Christmas.